I saw a story on ‘BBC World’ about an art curator from the World Trade Centre, he was talking about losing his Jamaican friend in the tragedy, I didn’t hear his friends name was, only that he was an artist. They showed his work, these amazing sculptures which were oddly prophetic. Tall black men, apparently modelled after his own body, wide flat noses and burnished bronze skin. Men, dressed as pilots, some wore leather aviator helmets others had planes ploughing into them, other sculpture’s were just limbs. Out of everything that I’ve seen, out of all the horrible images, the people free falling, the fire balls, the twisted metal, the plane being swallowed by the building, it has been these sculptures that haunt me most, these towering sculptures that are now somewhere, mangled in the wreckage of the World Trade Centre. With the little information that I had, I did some research. 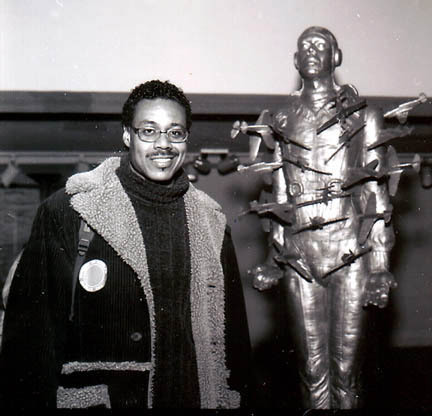 The artists name is Michael Richards, he was born in New York but grew up in Jamaica, his work won him a scholarship that provided him with a studio space with a view, a studio on the 92nd floor of WTC 1. Michael Richards (1963-2001) may you be at peace.